In issue 13 we talked to Norman Jorgensen, author of many books including The Last Viking, and In Flanders Fields. I live just out of Perth city in an old Federation house built in 1906. It is a bit too cosy; in fact, it is far too small for all the books I have collected over the years. If I buy any more books my wife and I will have to go and live out in the garden shed along with the rakes, spades, half empty paint cans and redback spiders. I love the way stories develop from just the flimsiest shred of a single thought or sentence into full-blown worlds full of exotic places and interesting out-of-control people. I also love the ego stroking that comes with the job. People seem to think writers are special, especially children’s book creators, and treat us accordingly. I know for a fact, however, that most kids’ book writers are just adults with arrested development issues, and have never really grown up properly. That is certainly true in my case. A real bonus being a writer is that I get to travel to all sorts of great places for literature festivals and writers’ talks, and get to meet kids who like reading. There was a load. One I remember and was very keen on was as series by Anthony Buckeridge, called Jennings and Darbyshire, about boys in an English boarding school that was an awful lot like Hogwarts. Unlike Hogwarts, though, Linbury Court Preparatory School was a ripping and topping place with midnight feasts, easily fooled school masters, japes and pranks, and, fortunately, or perhaps unfortunately, no wizards. The books were also a great deal funnier than Harry and Co. They kept me in stitches of laughter for days at a time and I loved them. My other great favourite was Biggles by Captain WE Johns, a series of nearly a hundred books about an ace World War I fighter pilot who never seems to get any older and also flies planes in WWII and into the jet age, and has hair-raising adventures together with his chums, Ginger, Smyth and Algy. They are probably horribly dated by now, but at the time they sure kept me wide awake at night. My first book came out years ago. It was a graphic novel illustrated by Allan Langoulant and was called Ashe of the Outback. At the time I had no real idea of what I was doing and used to flood Allan with hundreds of ideas, often on coasters or scraps of paper. He was very patient with me and managed to pull them into a sequence that made sense and that he could illustrate. Luckily for me, he was such a clever artist and well-known that that a publisher soon contracted it. 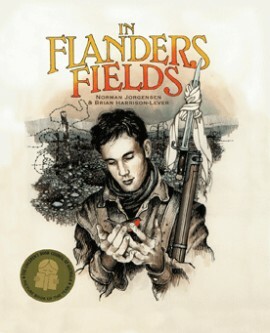 My fourth book In Flanders Fields proved to be a much harder task. A picture book about the war in the trenches for small children? Are you joking? A number of publishers couldn’t see past the idea that picture books don’t always have to be about talking rabbits or cute teddy bears, or for little kids, and instantly rejected it. Luckily, the crew at Fremantle Press weren’t so traditionally bound. Like all writers I read a great deal. I like comedies and funny writers, historical novels, spy thrillers and well constructed sentences but, above all, I like a good story that drags you along with it. I also love travelling, especially with my gee-wiz top-of-the-range camera and taking photographs, especially to Europe. I love the old castles, cathedrals, villages, country pubs, museums, battle grounds and all the stuff that makes history so exciting. I like woodworking and have made several pieces of furniture using old recycled Jarrah. I love the smell of wood shavings and the sense of achievement when you do something as well as you can. Truthfully? I saw an old film when I about fifteen called Beloved Infidel, starring Gregory Peck, about the famous writer F Scott Fitzgerald. 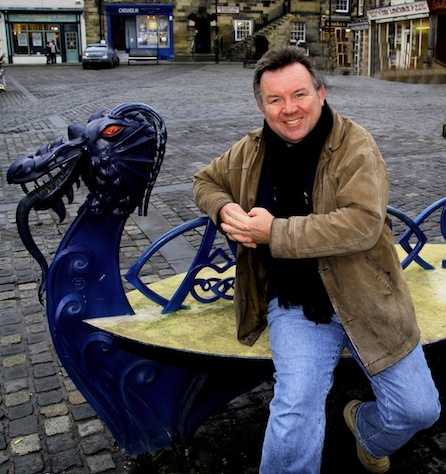 He was a romantic, tortured writer and as a teenager I could see myself being just like that. These days I’m not particularly tortured and, sadly, neither do I look like Gregory Peck or F Scott Fitzgerald. Ashe of the Outback was inspired by Biggles (and The Jolly Postman). In Flanders Fields is from a scene is a movie called All Quiet on the Western Front. The Call of the Osprey came from all the times I spent with my grandfather in his marvellous old workshop in Northam. A Fine Mess is from a poster I have on my office wall of old comedy duo Laurel and Hardy, and also the adventures my brothers and I had growing up in Kalamunda. Another Fine Mess 002 has James Bond stamped all over it. Jack’s Island is a collection of stories about my father’s life growing up on Rottnest Island during the 1940s. The Last Viking I wrote because of my Danish name, and the thought that perhaps one day I should do a Viking story to honour the ancestors. You never know if they are watching. If they are, I hope they like it. It has only just been released. Yes, ignore all advice!!! Except, practice writing a lot. Just like violin or netball training, the more practice you put in the better you get at it. Oh, and always carry a notebook with you to jot down ideas when they occur. They are such fleeting things and are easily forgotten. Also don’t take rejection too personally. Pick yourself up, dust yourself off, and start all over again. Are you working on a book at the moment? Can you tell us anything about it? Hmmmm … There are three on the go. The Goldminer’s Son is a picture book, based on a true Western Australia story, about a miner trapped underground, his son’s steadfast belief he’ll be saved, and the heroic efforts to rescue his dad from a flooded pit. Brave Art is about a girl who doesn’t fit in at a school, at home or with her friends. All she wants to do, with a single-minded passion, is paint pictures like the Great Masters and become a famous artist herself. Luckily, it has a happy ending as she does achieve her ambition. Sons of the Desert is, hopefully, an authentic and action-packed, rip-roaring, page-tuning, old-fashioned adventure with horses, villains, stagecoach robberies, explosions and enough realism for you taste the dust and feel the heat as the battles rage. 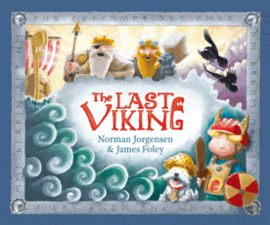 Find out more about Norman Jorgensen and his books on his website and check out The Last Viking blog, too. Norman also answered our Three Quick Questions as part of our third birthday celebrations in October. You can read his answers here. Previous Post Summer Issue 2011 – out now! Good luck with your author study!